Known for its bohemian charm, and slightly run down historic appeal, San Telmo is the neighborhood of Arts and Antiques, Tango and timelessness. San Telmo is energy-filled, quaint and funky on any day of the week, but on Sundays it truly comes to life. 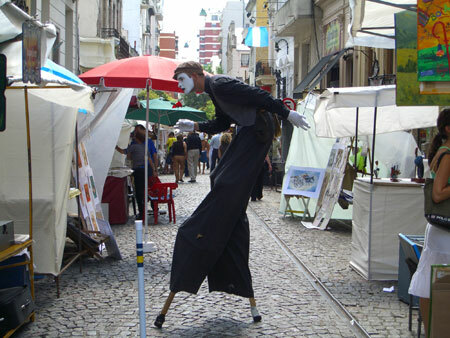 Centered around the Antiques Fair in Plaza Dorrego, and stretching down the cobblestone Calle Defensa, a Sunday visit to San Telmo is a highlight for visitors to Buenos Aires. Artisans, musicians, street performers, and elderly antiques vendors come from near and far to share their treasures and their talents with the public. 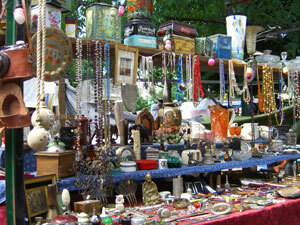 Start at the antiques market, which overflows in the Plaza Dorrego. From jewelry and dresses, to army helmets and tango records, you could spend hours sorting through the plethora of ancient goods. Even if antiques aren’t your thing, exploring the market is like having a key to your grandmother’s attic, or a window into Argentina’s past. If you aren’t satisfied with what is on offer in the Plaza, stroll down Defensa and there are dozens of well-established and stylish Antique stores to cater to your desires. Calle Defensa, San Telmo’s main drag, becomes a pedestrian peatonal for most of the day on Sunday. You can take a long and mellow stroll down this classic street, and enjoy all that it has to offer in peace. Musicians and artists set up all along the avenue, from full scale Tango orchestras to solitary singers and everything in between. The traditional bevy of street artists are their to entertain, human statues painted in gold, clowns on stilts, and the most entertaining, the man caught in the storm, complete with blowing jacket and inverted umbrella. Arts and crafts from local artisans are for sale up and down the strip and are fun to peruse. If you need a mate gourd, new silver earrings, or wooden crayons, then this is the place to be. Dozens of artists set up on Humberto Primo, running west of Plaza Dorrego, selling every manner of Tango art, paintings, pictures, sculptures, etc. And in a warehouse space, off the corner of the plaza, you can find inexpensive and handmade clothes, great for updating your wardrobe with typical Argentine fashions. If hours of exploring in the sun have peaked your appetite then head off the main drag to one of San Telmo’s modern and tasty restaurants. Origin, on Peru and Humberto Primo, or Territorio, on Bolivar and Estados Unidos, serve up healthy and delicious meals, featuring a menu of the day that will satisfy even the most discerning taste buds. Or try an Argentine Picada, an assortment of meats, cheeses and olives, at one of the outdoor tables along Calle Chile. If you want a sandwich on the go, then grab a choripan at the stall on Carlos Calvo, one block west of Defensa. A true locals scene it can be highly entertaining to sit with the dozen men who seem to spend the better part of everyday here and enjoy your salty snack sitting under the awning. San Telmo is full of art galleries, bookstores and traditional local cafes. Wander away from the tourists and check out what the rest of the neighborhood has to offer. A good selection of English language books can be found at Walrus Books (on Av. Estados Unidos 617), and local fashions can be found in any number of quirky boutiques. Grab a map of the area and check out some of its sites of interest, like the National Historical Museum, 1600 Defensa, or the baroque Iglesia Nuestra Senora de Belen, 340 Humberto Primo. As the day winds to an end the vendors pack up their goods and the street performers remove their make up. But don’t leave just yet. As the plaza clears out, the restaurants set up and tables fill the square. A perfect spot to enjoy an evening aperitif, try Gancia an Argentine favorite, and relax for a few hours in the waning hours of daylight. 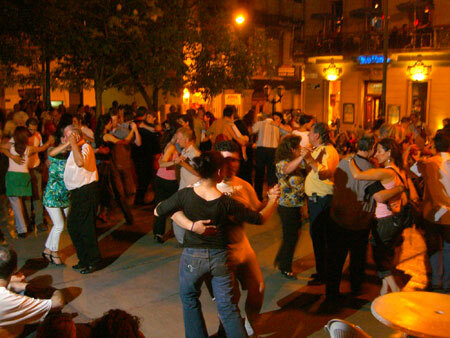 At night, the plaza hosts an outdoor Milonga, an open tango dance party. Locals come down to enjoy the warm night air and show off their tango skills, and everyone mingles in this friendly community. The open air Milonga in Plaza Dorrego is a great way to enjoy tango and folkloric dances without paying the outrageous fees of an overly theatrical tango show for tourists. Grab a place to sit amongst the locals to admire the flare of Argentine culture and the unique and endearing charm of San Telmo on a Sunday. hi…i havent gone never to san telme..but my boyfriend is there..i miss him. Buenos Aires is truly magical – spent some time there last year and remember a host of lazy afternoons spent at El Federal – a MUST if you’re ever in San Telmo! This page rendered in 0.929 seconds.